William & Mary was recently awarded the ‘Best Venue for Unique or Locally Sourced Catering’ by Unique Venues, a professional organization for non-traditional event venues. Member William & Mary Conference and Event Services submitted the nomination for the award. 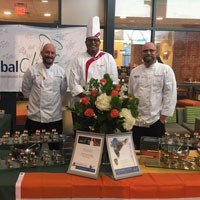 Every fall and spring since 2014, William & Mary has welcomed chefs from around the world. They have represented the cuisines of China, Chile, Netherlands, Ireland, Colombia, Poland, Russia, Sweden and Malaysia.